Mold, athlete's foot, and mite are the three most common problems during wet season. In fact, you can call them the "villainous trio" of the rainy season. In this article, we'll feature you great tips on how you can counteract all of these problems easily. What are Grain and Flour Mites? There are many types of mites. Aside from house dust mites, mites that commonly infest food products are called flour mites, grain mites or simply storage mites. As their name implies, they infest mostly wheat germs, flour, cheese, ground grains, powdered milk, yeast, and cereals. What are the Health Effects of Mites? Some people are allergic to mites. Coming in contact with foods infested with mites, either by inhalation or skin contact, can cause sudden intense itching (grocer's itch / baker's itch), or asthma attack. Sometimes, mites can even cause anaphylaxis (pancake syndrome), which is a severe life-threating allergic reaction. What You Should Do to Prevent Mite Infestation? Damp, dark, and warm places are mite's ideal environments for rapid multiplication. Yes, that includes your kitchen cabinets! In fact, storing dry goods at room temperature for 1 month to 6 months (the shortest on average), will only attract millions of mites in it. But don't worry. 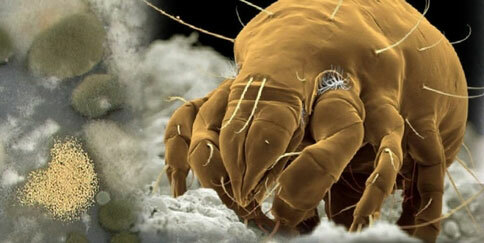 There's still a place in your kitchen wherein mites won't live and proliferate. And that's in your refrigerator! The low temperature inside the refrigerator can help stop mites from multiplying and eventually kill them. When you have a lot of food products that you won't use for a long time, including a lot of sugar, flour, and flavor ingredients, it is recommended that you store them in the refrigerator. Better yet, buy only dry goods that you need or buy in smaller quantities. How Molds Affect Us During Rainy Season? Molds are fungi that feed on organic matters. They grow in colonies and multiply through spores. These spores are what make many health issues like allergy and respiratory problems. In homes, they commonly inhabit places like bathrooms because of their moist and humid environment. But molds can affect any parts of your house especially during wet season as ceilings absorb the water due to dampness and moisture. Molds can damage your ceiling if left uncleaned. Below are some great tips on how you can easily clean the molds in your ceiling. Dip a clean cloth with alcohol and use it with your floor wiper to reach and clean the surfaces of your ceiling. 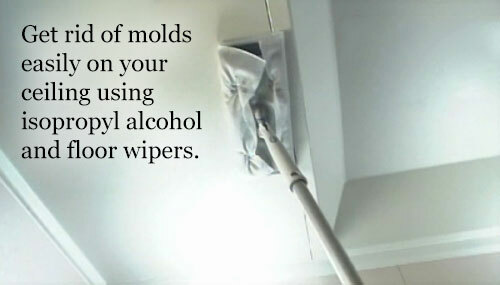 The alcohol works both as a disinfectant and in cleaning the stained area of your ceiling. After one month of doing this regularly, you'll be surprised to see how you were able to significantly reduce mold growth. Depending on the shape and material of the ceiling, in some cases, the use of isopropyl alcohol is not suitable. When cleaning your ceiling, observe proper safety measures and wear masks and goggles as needed. Athlete's foot is the most common fungal infection affecting the skin between the toes especially during the rainy season. It affects more men than women. Recently, however, women suffering from athlete's foot are increasing, and younger people constitute most of this increase. About 70% of athlete's foot cases are dry type. This type of athlete's foot is associated with dry, cracked and peeling skin, as opposed to the 'wet' type athlete's foot, which usually has reddish and blotchy fluid-filled areas. The main problem with the dry athlete's foot is that it is more susceptible to fungal infection as the fungi and bacteria can enter through the cracks in the skin, making the condition more severe if left untreated. Do not play around with your feet too much—avoid scrubbing with nylon loofah, and using pumice stone, or nail file to remove dead skin. These things are not recommended as they will only damage the skin further and will only make it easier for more fungi to penetrate the skin. This is what happens especially among women. In fact, the increased incidence of athlete's foot among young women is attributed to this "improper health care". If you notice that you have the basic symptoms of athlete's foot, like flaking or scaling skin, try to use topical antifungal creams or some over-the-counter athlete's foot medications. They're still the best treatments for athlete's foot as they can kill the fungi directly. Keep using the topical cream for at least one month even the symptoms had already cleared up. This will help prevent athlete's foot from returning. If problem still persists, we recommend that you consult your doctor or see a podiatrist.